Opposition figures were not the only ones who were attacked during the Ghods Day rallies on Friday, September 18, according to a pro-regime news service. Reports of assaults or attempted assaults on green leaders such as former President Mohammad Khatami, Mir Hossein Mousavi, and Mehdi Karroubi quickly spread trough the Internet on Friday. 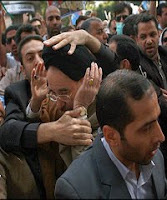 However, only news of an attack on Khatami could be confirmed. 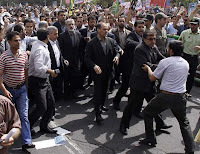 The former president was manhandled near Palestine Square, north of Tehran University, by a mob led by Abolfazl Shariatmadari, son of Keyhan editor Hossein Shariatmadari. Parleman News, the news service of the Imam Line Faction of the Majlis, posted photos of that attack on its web site. The alleged attacks on Mousavi and Karroubi, reported by the Islamic Republic News Agency, appear to be attempts by the regime to portray the opposition leaders as unpopular. According to IRNA, the two men 'had to leave the rallies in their automobiles after being attacked by angry people.' Footage and photos of Karroubi on Ghods Day show a beaming cleric being acclaimed by tens of thousands of supporters as he made his way from Hafteh Tir Square down Karim Khan Zand Street. One photo shows a single man charging towards Mousavi, but neither his bodyguards, nor the presidential candidate appear unduly perturbed. The news service goes on to say, 'When these people saw [Assadollah] Badamchian, representative of Tehran, former Interior Minister [Ali] Kordan, and current Commerce Minister [Mehdi] Ghazanfari, they physically attacked them, and insulted them with obscene and inappropriate words.' The report also claimed that Ghazanfari's car sustained 4 million toumans (NB about $4,000) in damage. Badamchian, a Principlist and deputy head of the Islamic Motalefe Party or Islamic Coalition Party, has been vocal in his criticism of the green movement. Kordan was mired in a scandal involving his fake doctorate from the 'Oxford University of London.' He was impeached and sacked by the Majlis in November of last year. It should be noted that Bultan News is considered pro-regime. Its web site was brought down by opposition supporters through a cyber-attack in the month of June.